Monks we know all about, but hermits are still mysterious and medieval. 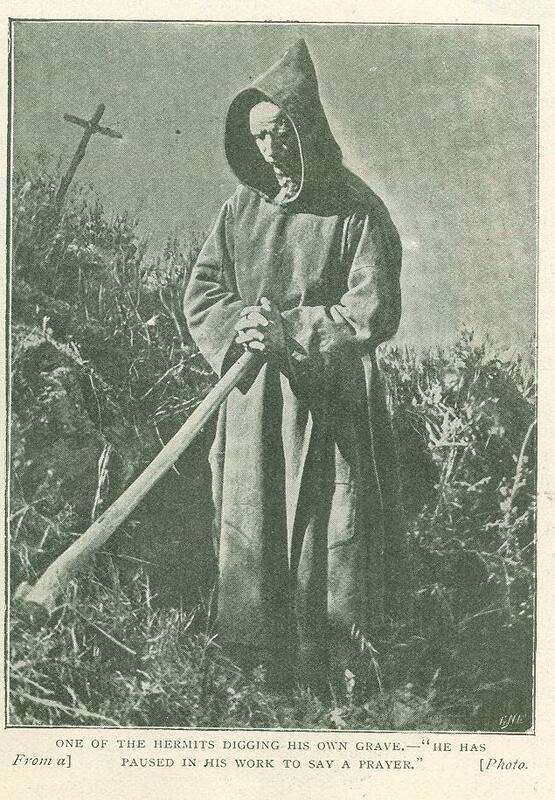 The following is a graphic account of a community of hermits inhabiting the wilderness of Cordoba, in Spain. Illustrated with photographs and described by a gentleman who paid them a visit, provided with a. special permit from. 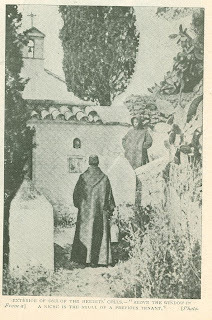 the Bishop of Cordoba. For everything really medieval and least impaired by the lapse of centuries we must go to Spain, where nothing changes except Govern­ments and a few other details which really do not matter. 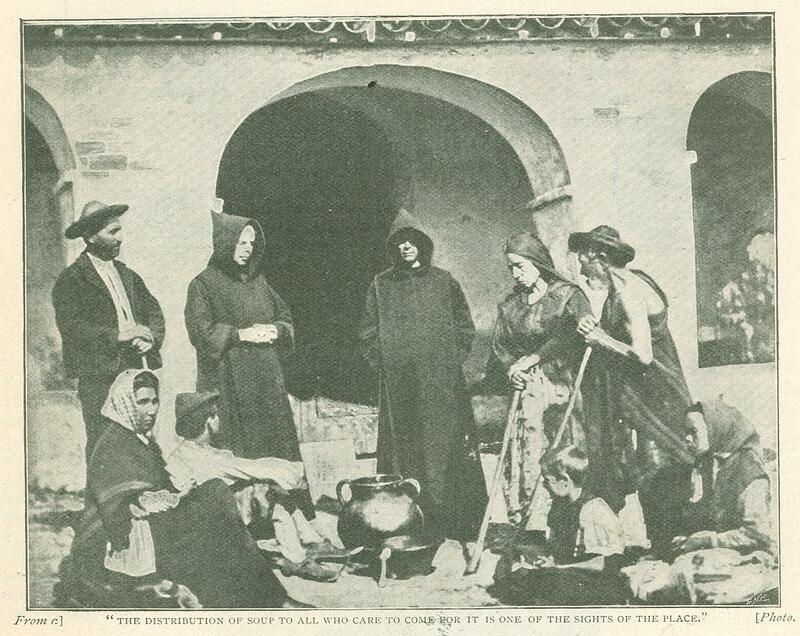 So to Spain I went in search of hermits, and was fortunate enough to find a goodly number of them scattered about upon the Sierra Morena, a league or so to the north of Cordoba, the ancient and glorious capital of the Moorish Empire in Spain. If they do not quite come up to the expectations conjured up by the hermits of legend and art, my hermits are, at any rate, deeply interesting in themselves, and afford us a vivid picture of the life and ideas of the average hermit three or four hundred years ago. Hermits, known as "Sons of the Wilderness," have occupied this mountain since beyond the memory of history. The first definite record of them is in the year 1309, when a band of Castillian soldiers deserted the army of Ferdi­nand IV and took to the hermit's life­ "resolved," as an old chronicler puts it, "to wage war henceforward on behalf of the King­dom of Heaven." The original hermits are thought to have come from Egypt, or at any rate to have adapted their mode of life from that of famous Egyptian hermits. Though the hermits we are about to consider are so near to Cordoba, they can boast of a full measure of seclusion. To begin with, we may not visit them without a special permit from the Bishop, and this is not very readily granted. I have to present myself at his palace punctually at a certain hour and explain, in broken Spanish, to his chaplains the reason of my request - what my motive is, what the result of my visit will be, etc. They are very courteous, but inclined to be a little suspicious. Am I "a North American"? Heaven forbid! (I have a purpose to serve.) They smile graciously. Am I a Catholic? Of course - though I do not enter into vexed questions of Roman and Anglican, which they would not understand. At last they are satisfied, and I am furnished with a document addressed to "the Chief Brother of the Hermits," and setting forth that"we grant our license to Mr. Herbert Vivian and any other persons who may accompany him to visit the desert and chapel of Our Lady of Belen, provided the established rules are ob­served. But no permission is given to pass the night in the desert; and this license is only available for three days from the date of issue. THE BISHOP OF CORDOBA." Ladies used not to be allowed in "the desert," and even nowadays they are only accorded permission if accompanied by male relatives. So the solitary modern globe-trotting girl is hereby warned off. Then come difficulties of access. The hermit­ages are only a league away, but the road is infamous, and the cabmen of Cordoba declare with one consent that the thing can only be done with three horses and for a payment of seven dollars. However, I have been long enough among Spaniards and Orientals to know how to drive a bargain; and eventually, after waiting almost the full tether of my permit for the weather to clear, I set out with only two horses, and for a conscientious price. But the road proves as impossible as even the cabmen had pictured. Never have I traversed such roads - no, not even in Bulgaria. The result is that I have to walk the greater part of the way. Still, when I come to "the desert," I feel that I have been amply repaid for all my toil and worry. It is not at all a "desert" as we understand the word. Indeed, the sole thing the place has in common with a desert is its loneliness. We make our way up the slopes of a well-wooded mountain, amid orchards of olives, Moorish rose gardens, palms, aloes, chestnuts, cactuses, and all kinds of tropical plants. Every now and then great tufts of geranium lend a fragrance to the air. Surely the" desert" has fulfilled the Scriptural prophecy and" blossomed as the rose." From Cordoba itself, and from the shaky railway by the Guadalquivir, the scudding tourist may catch a glimpse of the hermitages­ - a number of glistening, whitewashed cottages, nestling among the dark woods of the mountain. But the guides will have told them that there is nothing to see but the view, and they will have grudged an after­noon deducted from the treadmill of churches and galleries. These recluses and their simple lives do not appeal to the slaves of the red-bound guide­books. But I grow excited at the prospect of an inter­view with a latter day Simon Stylites, and my spirits rise as the air grows rarer and more exhilarating, and at last the details of the "head brother's" hermitage are distinctly visible. Adjoining it are the chapel and refectory. The dwellings of the other hermits are scattered about the hillside at sufficient distances apart to secure the privacy which is the anchorite's ideal. When at last I arrive I find a simplicity and modesty which exceed all my anticipa­tions. Head hermitage, chapel, and refectory all together only make up the humblest little whitewashed cottage, with a red-tiled roof and a small belfry surmounted by a cross. In the rude yard outside over a score of beggars (never to be avoided in Spain) are crouching in groups over the coarse but ample fare which the hermits never refuse to any who care to come for it is one of the sights of the place, and ought not to be missed. Some of the beggars are in a dreadful condition of raggedness and misery. One of those in the beautiful photograph here reproduced has little more than a rug for all clothing, and it does not suffice to shield his shoulders from the sharp air. The countenances of these beggars wear that expression of mingled wistfulness, gratitude, and dignity which is the characteristic of mendicants all over Spain. The soup is brought out in a large earthenware tureen of medieval shape, glistening with cleanliness, and tilted out into a bowl, from which it is eaten with three large wooden spoons, which are handed round in turn. A couple of young hermits are surveying the scene with benevolent smiles, which have endeared them throughout the whole countryside. One of these young hermits comes forward to welcome me, and explains that the rest of the brethren are still in the refectory. 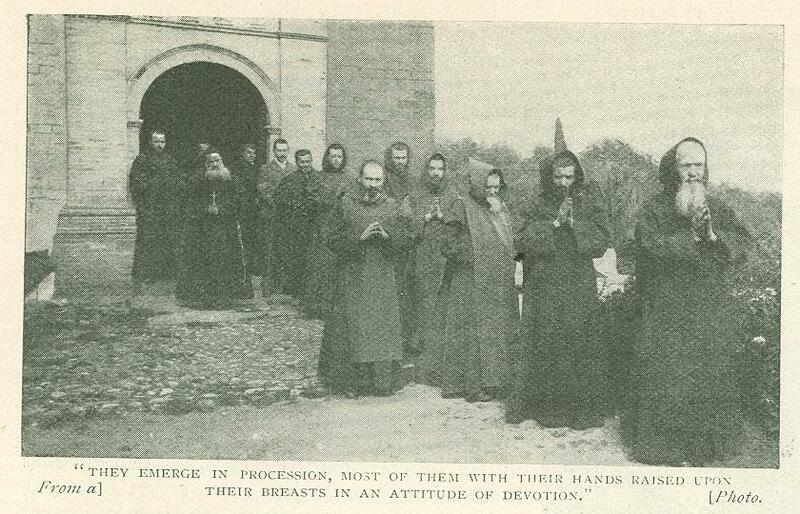 In a few minutes, however, they emerge in procession, most of them with their hands raised upon their breasts in an attitude of devotion, as if they were still reciting their grace after meat. Among the group is a young man from Cordoba, who has been privileged to share their frugal fare. In spite of their austerities, the hermits all look the picture of cheerfulness. The head brother has a particularly kind expression, and, after examining the Bishop's permit, which I hand to him, he makes me an amiable speech every word of which he evidently means. He then bids the young hermit accompany and show me everything. First, I am taken the round of various hermitages and told something of life there. At present there are seventeen hermits and one novice in "the desert." They maintain rigorous silence, and are completely isolated from each other during the greater part of the day, only meeting for the daily mass and the pious reading which follows it, and for their midday meal in the refectory. Breakfast and supper are prepared and eaten by the hermits each alone in his little cell, where he has a simple kind of kitchen. Most of the day and night is spent in meditation and prayer, very little time being accorded for sleep; five hours out of the twenty-four, however, must be devoted to manual labor, generally digging and various forms of gardening. One advan­tage the hermits have over monks is that they are very little bound by rules, but are free to choose their own times for most of their occupations, the regular hours of prayer alone excepted. The habit is for the head brother, as he goes through his own devotions in the chief hermitage, to sound the bell in his little belfry. Every cell is provided with a belfry and bell of its own, which, each hermit must sound when he hears that of the head brother. In this way they make sure of observing the hours of prayer simultaneously. To omit to sound his bell is held to be a grave remission of duty, and entails a severe penance. The next photograph represents the outside of one of the cells. It is certainly very picturesque with its stately cypresses and great hedges of prickly pear. My guide is standing on the pathway which leads to the mountain, and the owner of the cell is just returning with a pitcher of water winch he has been. fetching from the well some distance off. Above the little window, which is closed by a thick wooden shutter, we see in a niche the skull of a previous tenant. It wears an expression of deep calm, and seems to smile as it reminds us of the shortness of life. In­side the cell we find little more than bare walls. All the furniture there is consists of a hard mattress, where the hermit passes his few hours of sleep; a praying stool with a heavy, antiquated book of hours, printed in the six­teenth century; a large rude crucifix; a couple of pitchers, and the few things required for the simple cookery. I can scarcely restrain my amazement at the cheerfulness which sub­sists in so terribly depressing a dwelling. Most of the other cells are identical with this one, and need not be particularly described. That of the head brother is not more luxurious. His hermitage is only larger because it comprises the chapel and refectory under the same roof. In the chapel is a large and some­what imaginative picture of the "desert," as it appeared in bygone days. Though the perspective is not what it might be, we can see that the hermitages are still much what they were in the Middle Ages. The gardens seem to have improved, but there is, the same predilection for cypresses. Next we come to the house of the novices, which is some distance apart from the other hermitages. When there are several, the novices live all together, but as there is only one at present, the hermits take it in turns to stay with him and fit him fur adopt­ing their mode of life. The novitiate lasts six months, which is found quite sufficient to deter any who may have no real vocation for the life. Besides their regular devotions, the hermits constantly repair for prayer to various parts of the "desert" which may be hallowed by sacred associations. 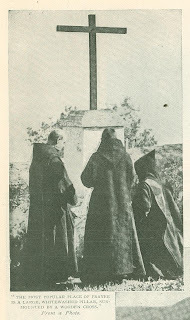 For example, the graves of deceased hermits are favorite resorts, but the most popular place is a large, whitewashed pillar, surmounted by a wooden cross. Here, tradition says, a hermit was once upon a time martyred by the Moors. Though the hermits may not speak when they meet in this way, except for reasons of charity or necessity, they doubtless feel it a relief from their solitude to meet other human beings. My guide would not allow this, saying that if that were the object of their coming to the place of prayer it would be a sin which they would have to confess and do penance for. Confession, by the way, is frequent, but generally quite voluntary. Any hermit may give absolution, but most of the community prefer to come with their sins to the kindly old head brother, whose sympathy and com­mon sense may always be relied upon. seclusion of their lonely "wilderness." But they certainly seem to deserve the title of "Sons of the Wilderness," by which they have been known to the outer world for so many centuries. They appear to revel in the barest and loneliest corners of their domain, and to find supreme happi­ness in cherishing the most gloomy and morbid thoughts. Notice the beatific expression of the fine old fellow in the next photograph as he digs his own grave. Like an animal about to die, he has chosen for his last resting-place a spot as far away as possible from the habitations of the living. With a huge pick he has cleared away the brambles and made some progress with his digging. He has paused in his work to say a prayer, and is reflecting upon that blissful state where the wicked cease from troubling and the weary are at rest. He came to the hermitage in the hope of forgetting all the sadness of his former life, but he has long ago realized that there can be no complete forgetfulness on this side of the grave, and for death accordingly he yearns. I saw many other weird scenes such as go most largely to make up the life of the "Sons of the Wilderness." 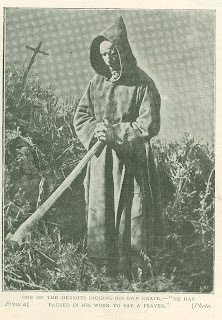 In one spot I beheld a fervent hermit, clad in his uniform of a scapulary and cowl of grey cloth, holding a rosary and praying in most absolute solitude before a skull set upon a rock. Presently he heaves a deep sigh of penitential devotion and prostrates himself upon his face before the grisly emblem, clasping his hands in an agony of self-abase­ment, and remaining motionless for end­less minutes amid the deathless silence of Nature. The scene carries us hack into the Dark Ages, and I know not which is grim­mest - the mocking expression of the skull or the derisive gaiety of the palms and rose bushes in the background. A bell tinkles in the distance, and the rapt hermit rises slowly from his knees, with a strange, far away joy lighting up his rugged face. And I return to Cordoba. Originally published in the Wide World Magazine. December 1899.